Microsoft has announced the Xbox Games with Gold lineup for March 2018. Xbox One subscribers can download Trials of the Blood Dragon from March 1 to 30. Trials meets Far Cry 3: Blood Dragon and it’s not all about the bikes anymore. There’s running, shooting, swinging, tanks, jetpacks and BMXs to play with. Then, from March 16 to April 15 on Xbox One members can grab Superhot. In a new twist on the genre, time stands still if you do. Plan your moves, dodge bullets, and win the battle. 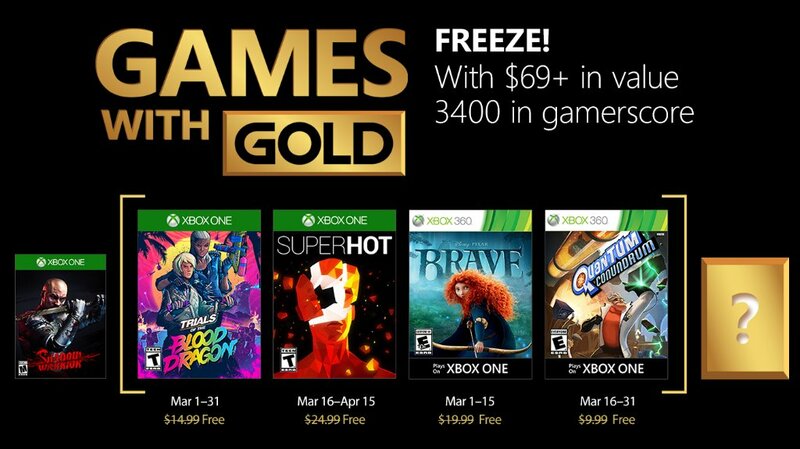 Available March 1 to 15 on Xbox 360 and Xbox One via backwards compatability is Brave: The Video Game. Battle your way past enemies as Merida, honing your combat skills and working to break a magical curse. And finally, from March 16 to 31 on Xbox One and Xbox 360 members can download Quantum Conundrum. As the nephew of your wild scientist of an uncle, take control of the Interdimensional Shift Device in his mansion of madness.